Gluten-Free Chocolate Chip Cookies Recipe - Nisbets Australia Blog - Industry news, trends, recipes and more! Whether you’re a home cook making a batch for your family. Or a café serving them as an indulgent snack with a freshly brewed coffee. 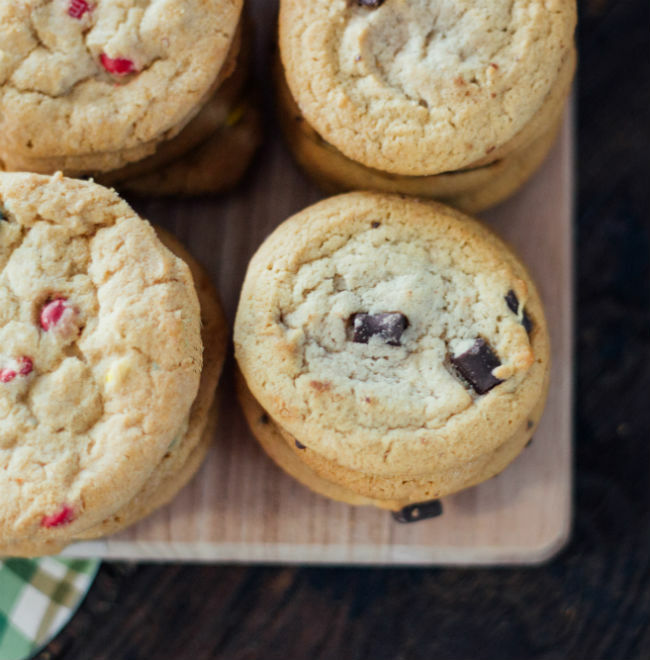 Whatever you have in mind, you’ll find these gooey chocolate chip cookies never fail to please. The edges are crisp. And the centre is slightly soft with pockets of rich, dark melted chocolate. What’s not to love? "Offer something your customers can easily put their stamp on. These cookies are easily customisable, warming and comforting." – Chef Rick Tarantino, M.S. Sift the gluten-free flour into a medium sized bowl and add the xanthan gum, sea salt and baking soda. In a separate bowl, mix the turbindo sugar with the white sugar. In a mixer, beat together the molasses or agave, grass fed butter and cream cheese until the mixture lightens in colour. Add the vanilla extract to the cream cheese mixture and add one egg yolk at a time, slowly beating the yolk into the mixture. While the mixer is slowly blending, gradually add the dry ingredients until just blended. Remove the batter from the mixer and add the chocolate chips. Use a wooden spoon to slowly fold in the chocolate chips. Refrigerate the dough for at least 3 hours and no more than 3 days. Take the dough out of the refrigerator and allow it to soften. This should take about 8-15 minutes. Preheat the oven to 195°C and line a baking tray with baking parchment. Split your dough into 12 even portions. If your cookies are different sizes they'll bake at different rate and risk burning. Bake for around 12-14 minutes or until golden brown. Take the cookies out of the oven and let them rest for 2-3 minutes, then place them on a cooling rack so they get a crispy base. Turn the cookies into an ice-cream sandwich. Bake larger cookies (about 100g each) and add some vanilla ice-cream in the middle of two cookies. Finish with whipped cream and chopped walnuts. Make this sweeter and spicier with half a cup of peppermint chips. Simply add the chips to the batter like you would chocolate chips. Coat the finished cookies in a variety of garnishes: sprinkles, coconut and cacao nibs. Replace half of the dark chocolate chips with a blend of fresh rosemary, vanilla chai spice, 120g walnuts and 1/4 cup of dried and chopped cranberries.